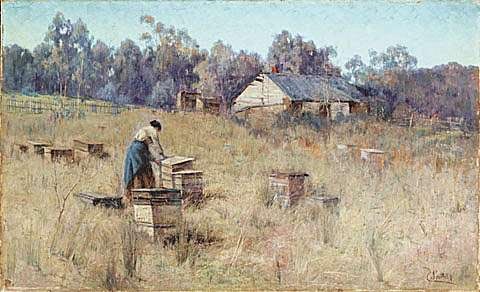 The setting for this work is considered to be the Ellis family’s farm, which was located in North Warrandyte, a short distance upstream from Blue Tongue Bend on the Yarra River. This was near the Frencham’s property. The model is thought to be Mrs Ellis. The work is typical of Clara Southern: poetic, lyrical, and painted in muted tones of blue and green that give a softness to her depiction of the Australian landscape.